Back for their 2nd year in a row, Shinyribs can't wait to bring the house down at Farmgrass Fest '17! A Shinyribs show is an exaltation of spirit. It’s a hip shaking, belly laughing, soul-singing, song-slinging, down-home house party. All styles of American music are likely to be touched on, squeezed on, kissed on by this world class band featuring Winfield Cheek on Keyboards, Keith Langford on Drums, Jeff Brown on Bass and the Tijuana Train Wreck Horns. Whiskey Shivers infuse their songs with punk rock energy and a darkly comical light-heartedness, stretching the bluegrass genre to fit whatever they feel is right. Whether they're playing at a backyard house party in Texas, a punk-rock dive bar or a sprawling country music festival, crowds take notice. People put down their phones, pick up their drinks and start dancing! Started by Farmgrass founder and president Talia Bryce and back-porch songwriter Christian Ward in 2007, The Lost Pines are excited to play Farmgrass Fest for their 4th year in a row! 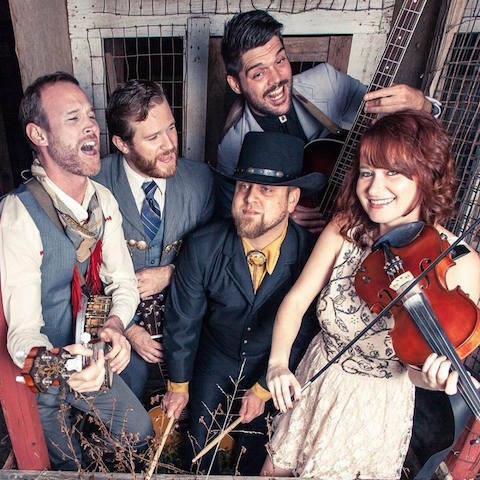 The Lost Pines never fail to entertain audiences of all ages with their original blend of heart-wrenching high lonesome bluegrass and toe-tappin’ Texas country. With a knack for balancing old with new, fiery picking with soulful vocals and respect for tradition with an eye towards the future, the Lost Pines create music that is both timely and timeless. "Like many of their Americana peers, country-grass band High Plains Jamboree celebrate days of old. In the song "Analog," a smart but sweet tune calling out "advertisements on my telephone" and GMOs, mandolin player Brennen Leigh croons, "I'm not down on it just because its new." But few do it with as much verve as this Austin, Texas, foursome. During a performance at East Nashville's Family Wash, the group wooed their audience with a sound that evokes Old Crow Medicine Show and Carolina Chocolate Drops, delivering string-based rave-ups and even a stray murder ballad – the haunting "Rozene" – all from behind a giant 1940s-style microphone." Founded in 2009, Austin-based Sour Bridges is a band that has turned into a tight-knit family. Established early on as a mainstay in Austin’s finest venues, the band has branched out in recent years to earn substantial airplay in the region and play roots music festivals UTOPiAfest, CMJ Music Marathon, SXSW, Daytrotter and more. The core duo of Lil Darlin is Austin-based Old-Lady Country singer Devin Jake and flat picking champion from the UK Sophia Johnson. Their tight harmony vocals and stellar bluegrass guitar are guaranteed to bring some legitimate grass to the farm. Bre Jarvis calls the Texas Hill Country home. She returned to the verdant landscape of her childhood in 2014, setting aside a blossoming career in theatre to make music instead. At her core a constant songmaker, she follows an impulse toward growth and a need to share her growing collection of songs. She is currently working on her debut album. The Mismatch is a band fronted by singer-songwriter Billy Wayne Roy. Good vibes abound from this homegrown, folk-some, americana group.